It's pasta night in our family tonight. Each Tuesday, the grown-up 'boys' arrive expecting a large bowl of pasta in the centre of the table, sometimes with meatballs, others with tuna and occasionally with prawns. 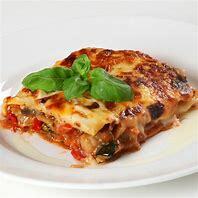 We always try to vary the pasta and the accompanying sauce and each of us has our favourites - tagliatelle is mine, but others like spirali or conchiglie and as for the sauces, there's loads to choose from. 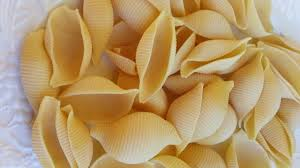 But did you know that each shape of pasta is designed for certain types of sauce? 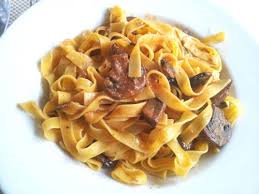 Tagliatelle - the thin flat ribbons (above) are usually made with egg and so go especially well with meat ragu, lighter spring vegetables and simple cream or tomato sauces. Conchiglie - these little shells are perfect vessels for heavy pasta sauces with meat or cream in. The larger shells, lumaconi, are often stuffed with filling before baking. Orzo or Risoni - 'big rice' in Italian, orzo cooks quickly and is a cheap and tasty way to bulk up a stew or soup. It can also be used in salads, or for a quick risotto. 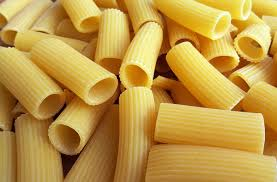 Rigatoni - similar to penne pasta but with straight cut rather than angled ends, its ridges are perfect for holding meaty tomato sauce like Bolognese, and is also delicious in pasta bakes.